This invaluable text/reference investigates the state of the art in approaches to building, monitoring, managing, and governing smart cities. A particular focus is placed on the distributed computing environments within the infrastructure of such cities, including issues of device connectivity, communication, security, and interoperability. A selection of experts of international repute offer their perspectives on current trends and best practices, and their suggestions for future developments, together with case studies supporting the vision of smart cities based on the Internet of Things (IoT). Topics and features: examines the various methodologies relating to next-level urbanization, including approaches to security and privacy relating to social and legal aspects; describes a recursive and layered approach to modeling large-scale resource management systems for self-sustainable cities; proposes a novel architecture for hybrid vehicular wireless sensor networks, and a pricing mechanism for the management of natural resources; discusses the challenges and potential solutions to building smart city surveillance systems, applying knowledge-based governance, and adopting electric vehicles; covers topics on intelligent distributed systems, IoT, fog computing paradigms, big data management and analytics, and smart grids; reviews issues of sustainability in the design of smart cities and healthcare services, illustrated by case studies taken from cities in Japan, India, and Brazil. 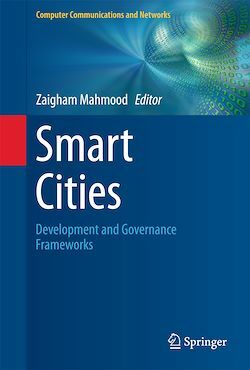 This illuminating volume offers a comprehensive reference for researchers investigating smart cities and the IoT, students interested in the distributed computing technologies used by smart living systems, and practitioners wishing to adopt the latest security and connectivity techniques in smart city environments.